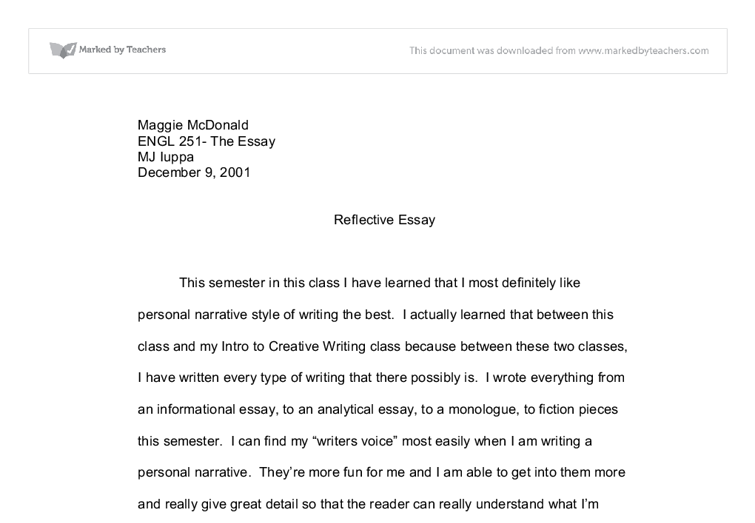 Maggie McDonald ENGL 251- The Essay MJ Iuppa December 9, 2001 Reflective Essay This semester in this class I have learned that I most definitely like personal narrative style of writing the best. I actually learned that between this class and my Intro to Creative Writing class because between these two classes, I have written every type of writing that there possibly is. I wrote everything from an informational essay, to an analytical essay, to a monologue, to fiction pieces this semester. I can find my "writers voice" most easily when I am writing a personal narrative. They're more fun for me and I am able to get into them more and really give great detail so that the reader can really understand what I'm trying to say. ...read more. I was able to share with them my writing easily and let them read it or have me read it aloud. It was when we had to start sharing with new people that the feeling of insecurity started to come back to me. I'm always afraid that people are going to laugh at my writing and think that I am not a good writer. My favorite reading of the whole semester was the Diana Hume-George piece (On Seat Belts, Cocaine Addiction, and the Theory of Germ Disease). I thought that was the best piece to read, and I believe that was one of the pieces that we started out with. I likes the little exercises that we did in class - where you would just have us write for about 15/20 minutes about some totally random thing. ...read more. I would like to say that for my product that I choose, I could not find any consumer reports. I spent most of the day looking. But I still thought that it was a great way to get into something that you normally don't think about being writing material. My least favorite assignment this semester was the comparing and contrasting of two stories. 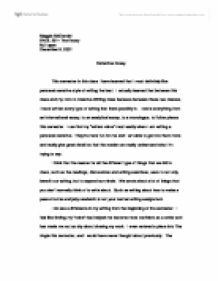 I usually don't have a problem with doing this type of essay, but for some reason it was causing me problems this time and I could not get what I wanted to say out in the words that I needed to say them in. Overall this semester, even though it was a very tough semester for me personally, I enjoyed this class a lot and I feel as if I have learned a lot of great things that will help me with my writing in the future. ...read more. As the time for her to leave became closer, I did not want her to leave, but I knew she had to. We made the decision to stay together even though two hundred miles separated us from each other; however, we knew the difficulties that we might have. "Uh, no. Not really," I reply, noticing a familiar taste of minty chocolate, like After Eights in my mouth after hearing her speak. "Now girls. You don't just throw the ball into the net willy nillyyyy! You have to stabilize the body. He told me that Marcus played baseball as well, knowing that we lived near one another and since neither him nor I drove yet he offered Marcus to bring me home if I ever needed a ride. My relationship with Marcus began and ended while Mike was there for me the entire time. "A whimpering, like a small animal caught and trapped moaning distinct now." Larry walks out not noticing Francis as he shrunk into the shadows but as Nicole leaves she sees Francis and new he'd watched what Larry had done to her and done nothing. The work became tedious for the boy; he only made this journey once a week yet for him it seemed centuries ago. I've never been infatuated before. My older sister used to say to me when I was young, that when I eventually do experience infatuation, I'll feel as though I'm in love. But "love and infatuation are different", she used to tell me. I believe when books get reviews that say "hard to put down" or "page-turner," it means that the book is so engrossing that it's hard to shake the reader out of the world they'd been sucked into, which is why it is possible for some to spend the whole day reading, and not even eat. Personal Essay | How has a place influenced you? I counted miniature make-believe troops and emperors, marching across the wall in uniform. I imagined numerous tourists taking pictures with sophisticated cameras that they knew nothing more about than the shutter and the on-off button. This seemingly less than great wall leaned next to another wall, but this trinket was a real piece of stone instead of a plastic replication.